There are hundreds of 2017 Holiday Gift Guides for pets scattered across the Internet. Many of them are helpful, others not so much. I’ve been reading those gift guides for pets and taken notes (I’ll be shopping for Soldier and Peanut Butter soon). I’ve visited countless stores and talked to manufacturers and pet experts, including dog groomers, pet behaviorists and veterinarians. I quickly realized that the lists can be overwhelming in their diversity, so I’ve put together my own holiday gift guide for senior pets since I have two seniors of my own. Mobility issues and arthritis pain are common in older pets, and I’ve found some gifts that can either make them more comfortable every day or help them continue to enjoy life despite limited mobility. The Pet Gear stroller features an easy-open, latching top and sturdy construction. When your dog or cat can no longer get around easily on his own, a pet stroller allows you to take him on walks outside, when you go shopping and on family outings. 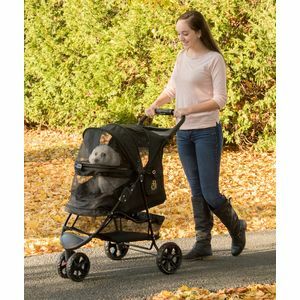 The design and structure are completely different from a traditional stroller, taking into account that pets are usually four-legged. The best ones have an upper compartment for your pet and include a sun and/or rain canopy to protect your dog or cat. Many also have a lower area where you can stow everything from your purse to poop bags. It makes getting out and doing all the things you’ve been doing with your dog or cat for years feasible once again, putting it at the top of our 2017 holiday gift guide for senior pets. 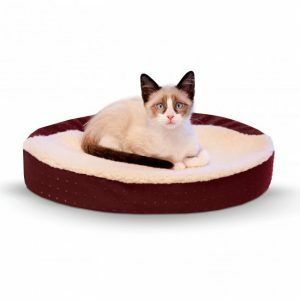 We love the K & H Pet Products oval orthopedic cuddle nest with memory foam. Orthopedic ‘mattress,’ preferably memory foam or a firm pad with an eggshell topper to cushion and support creaky joints. A removable, washable cover or a bed that can be easily washed, since many senior pets become incontinent at some point. A bolster back or raised sides on two or three sides for your pet to lean against. At least one side that is lower so that your dog or cat can easily get up and down without having to step too high. Soft material that will encourage your dog or cat to sink into its comfort. Dogs and cats who are older or who are sick are often cold even in your house. Pet bed warmers can warm up their bones gently and effectively, making it easier for them to get comfortable. The warmth can soothe aching joints and help them relax tight muscles. There are primarily two kinds, the first electrical pet bed warmer pads that either have their own cover or that are designed to be slipped under the cover of their current bed. If you don’t like the idea of having to plug-in a dog bed warmer, consider the many microwavable pads that can be nuked for a few minutes to provide hours of warmth. These vibrant, raised pet bowls will look great anywhere in your house. In general, cats are low enough to the ground to eat from any reasonably sized cat food bowl, but some senior cats and dogs can have problems eating without straining their necks, particularly if they are one of the larger breeds. Raised dog beds can ease the strain and improve their digestion as well. Look for sets that have both a water bowl and a food bowl that are removable for easy cleaning. 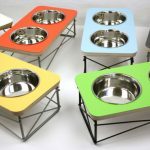 The stylish raised dog bowls by Modern Mews will fit into any décor and they have a bold, post-modern vibe in bright colors that will look great in any room in your house. Dogs of all ages love treats, so they are usually near the top of holiday gift guides for pets, but as dogs age it’s more difficult for them to chew on some treats. 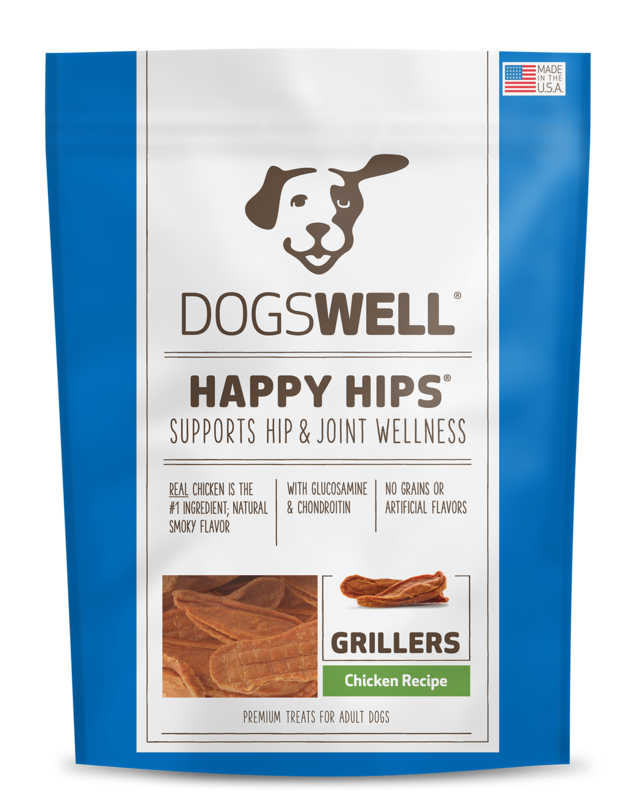 Look for tender, easy to digest treats that won’t upset sensitive tummies. If they also have some added health benefits they’re even better. 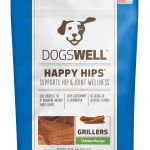 Dogswell makes a line of soft, chewable treats that include a boost of glucosamine chondroitin to support joint health and ease the pain of aching knees and backs. Dental health is another important factor in the health of senior cats and dogs. As pets age, their teeth can build up a layer of plaque and develop periodontal disease if not taken care of properly. Many older dogs and cats end up needing a professional teeth cleaning under anesthesia and the extraction of some teeth that may have decayed. To help keep your dog’s and cat’s teeth clean and their breath fresh, gift them with a bag of Greenies, delicious, crunchy treats that are designed to encourage chewing so that the treat’s texture and ingredients naturally reduce plaque and remove tartar from their teeth. 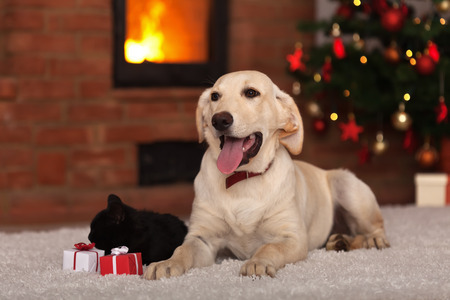 No matter which 2017 holiday gift guide you read or what you buy to put under the Christmas tree or to give on Hanukkah, your senior pet will be happy simply to enjoy the warmth and love of your company. But a really great gift to bring out their younger selves will be welcome, too! Next week, The Contemporary Pet will feature a holiday gift guide for pet lovers who are also fashionistas! Or for more ideas for your furry friends, check out our selections for the Eight Best Pet Toys of 2016.